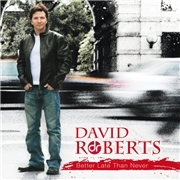 Wanted songwriter DAVID ROBERTS went into a 26 year hiatus after debuting in 1982 with the critically acclaimed “All Dressed Up”. He was apparently not aware of the impact of his music, until he was notified that the asking price on EBay of his old album was in the range of $300! His producer and keyboard player recruited guitarist Michael Landau, drummer Mike Baird, bass player Abraham Laboriel Sr., and percussionist Luis Conte, while Fred Mollin also brought together a band for the second part of the project. The musicians was awarded ten songs to work with, material written with or for the likes of JOHN WAITE, STARSHIP, and possibly anyone of the high class range of bands and solo musicians that David has worked with over the “missing years”. Opener “Best Thing I Never Had” is filled with wisdom of having and not having a family life. The arrangement, refrain and flow are absolutely top notch, a fine opener in deed. The JOHN WAITE penned “Stay with Me Tonight” is another highlight, as well as David´s personal favorite “What I´ve Been Missing”, the ultimate title track for this album! I find some of the tracks, e.g. “This Is How I Say Goodbye” too slow moving, too Westcoast, for my liking, but the average of this album is high. Nevertheless it´s not quite up to par with the other two releases from Avenue of Allies. The too poppy “Be Gentle with My Heart” doesn´t have the right “balance” betwixt Westcoast and AOR if you ask me, it´s more of a disguised pop song. Still, there´s mileage enough left in David, but perhaps primarily as a songwriter?